Abstract: The 11th Edition of the classic Andrews' Diseases of the Skin, by Drs. William D. James, Timothy G. Berger and Dirk M. Elston, provides the ultimate foundation in dermatology with comprehensive guidance to effectively diagnose and treat a wide range of skin conditions. These highly respected authors balance evidence-based treatment guidelines with advice from their own clinical experience, offering a practical and realistic medical perspective. Updated throughout with the latest dermatologic findings and a new chapter on cosmetic surgical techniques, this title helps you keep current, improve your skills, and prepare for exams. It also includes online access to the complete text, images, and bonus illustrations making this an indispensable, convenient reference for trainees and practicing dermatologists...Confirm your diagnoses by comparing your clinical findings to more than 1,150 illustrations, 40% of which are brand new. Update your surgical skills with chapters devoted to basic dermatologic, laser, and cosmetic surgery, contributed by Dr. Issac M. Neuhaus. Search the complete contents online, download all the illustrations, and view an additional 400 images, at www.expertconsult.com. 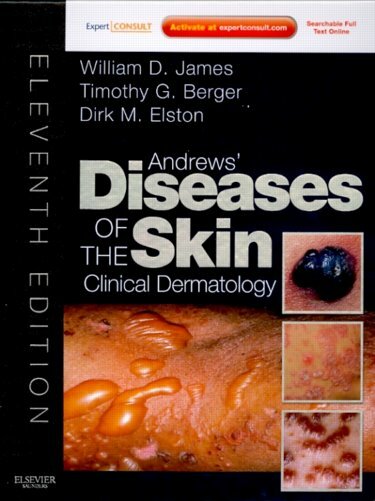 In Andrews' Diseases of the Skin, the authors provide practicing dermatologists and residents with the core information needed.